Arbitration is a cost effective and expeditious dispute resolution mechanism. A majority of commercial disputes are resolved through the mode of arbitration. 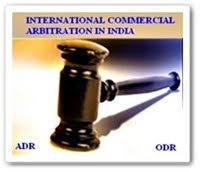 International commercial arbitration has also become an emerging trend these days. Generally, an arbitration clause is incorporated in various contracts and commercial contracts that prescribe resolution of a future dispute through arbitration. Traditional litigation is not a productive mechanism to resolve disputes as it is costly and time consuming in nature. Thus, there is a gradual shift from litigation to arbitration in commercial matters. A new aspect has been added to commercial dispute resolution and commercial arbitration by the information and communication technology (ICT). ICT has introduced a novel dispute resolution mechanism known as online dispute resolution (ODR). Although ODR in India has still to keep a pace yet it has been used in developed countries for many purposes, especially for resolving cross border e-commerce disputes. At Perry4Law Techno Legal Base (PTLB) we are not only providing training and courses on ODR but are also actively using the same for contractual and commercial disputes resolution in India. In fact, Perry4Law and PTLB have provided the exclusive technology dispute resolution policy of India and ODR policy of India so that ODR may gain popularity and a wider acceptance in India. PTLB has supplemented its ODR initiatives with other techno legal initiatives. The chief among them are e-courts research and training centre, digital evidencing centre, cyber forensics centre, etc. We hope our initiatives and efforts would be beneficial for the growth of online commercial arbitration in India and world wide.